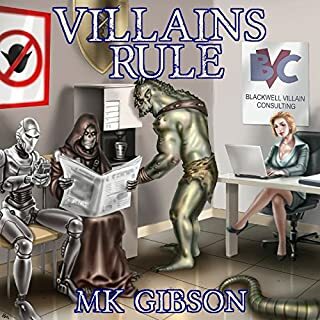 Get ready for the action-packed follow up to The Rules of Supervillainy. This time with zombies, zombified heroes and villains, cults, magic, super-science, a dragon, a giant Nazi robot, a Greek demigod, and so much more! Gary and Cloak have returned from the supervillain prison on the moon only to discover the city he plans to conquer and rule with an iron fist has been overrun with the living dead. Once again taking up the mantle of Merciless: The Supervillain Without Mercy(tm). 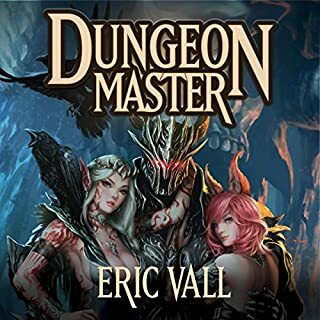 Gary will have to pull it together quickly, find his wife, his gang, and a whole lot of help to stop the Brotherhood of Infamy from slaughtering the population of Falconcrest City and opening a portal to summon a primal force of destruction. But Gary has a plan, or at least he's sure he'll have one soon. Just give him a second. Merciless is back!!! Having returned from the Supervillian Prison on the moon only to discover that his city is overrun by Zombies, Gary knows that he is the only one who can save the world, well with the help from his friends but you know, it's mostly him!! Oh and his wife has been kidnapped (well kind of) by a devastatingly handsome Greek god. What is a supervillian to do?? Once again, the author has given us some truly funny quips between Gary and his cloak and made me laugh out loud multiple times, yet he also managed to squeeze a lot of different emotions from me in this book. Gary gets to meet someone and it pulled at my heartstrings, but the biggest gut wrench was what happened to his wife! I have to say though that I loved the twist the author did at the end!! I can't say much else because I'll spoil it, so I'll just say, go read it NOW!!!! Again, the amount of different characters were extremely well written and developed. Usually in books with so many characters I find some of them are just back ground noise, not so here. The author really gives each character time to grow! I loved the Greek God!! In all, a really excellent second book. This has a bit of everything and I can't recommend it enough. I love the world and characters this author has created and look forward to the third!! Once again, Jeffrey Kafer nails it. He is Gary!!! I don't know what else to say about his narration that I haven't said before. He always does an amazing job with the performance and I never find any faults. 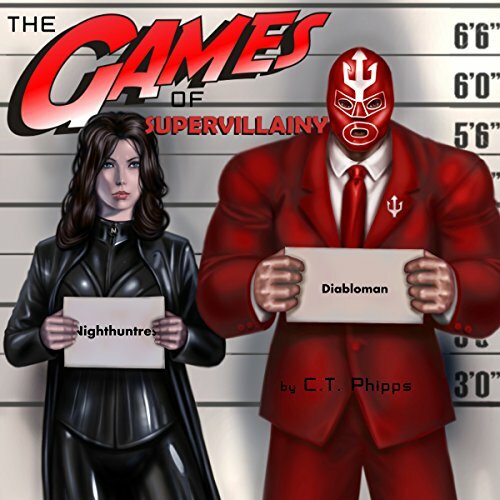 This is book 2 of the Supervillainy series, a comedic take on supers. After having been mistakenly sent the hero Nightwalker's magical cloak after he dies, Gary becomes Merciless: The Supervillain Without Mercy (tm). Thats right, he actually thinks of it that way. A hilarious romp as Gary and his minions Red Riding Hood (think Harley Quinn not quite as insane) and El Diablo, a down on hos luck former A list villain, Gary has to try and stop the Evil old god from being resurrected, stop the zombies from wrecking the town, and figure how to get paid at the end, while not having the wife, a vigilante hero named Night Huntress, leave him. Can Gary manage it, even with the help of Death herself (who bears a striking resemblance to his wife)? Well, you need to read it to find out. The characters are so funny, but have realistic motivations for their actions. There is a lot of snark that will keep you laughing the entire time. The setting, Falconcrest City, is a great setting, resembling Gotham and Metropolis, with a bunch of over the top villains adding character. 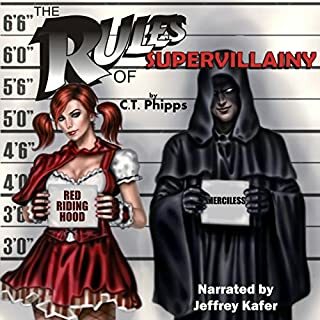 Jeffery Kafer hits this one out of the park with his narrations, really bringing the characters to life. Any fan of Jim Bernheimer's D-List Supervillain books to Ben Bequer's Blackjack books will love this series. This is such a different and fun series. Take some super villains, add in some superheroes, stir the pot with a zombie apocalypse brought on by a cthulhu-type destroyer god bent on devouring the universe, and you might be close to the level of craziness this volume entails. Sprinkle it liberally with humor and really quirky sidekicks, to taste. The story is brilliant, and I'm starting the next book tomorrow! It's Merciless ... Of Course I Loved It! I have fallen in love with this series, and Merciless is one of my all time favorite character's. 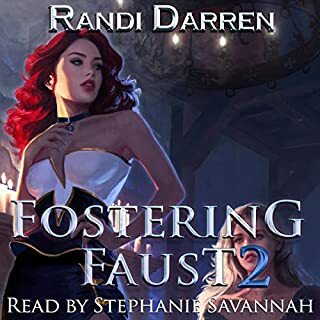 When I need a break from all the serious intense romance I listen too, it is awesome to come across a story that is so refreshingly different, full of banter, dry humor, and lots of laughs but what really makes this audiobook exceptional is the narration. In my opinion, laughter is one of the best medicines, and anything that is humorous is best experienced when you can hear it or see it, and Jeffrey Kafer really delivered a hilarious performance. In addition to the humor, he did an outstanding job of capturing all the different tones from the driest of humor to the angst Merciless felt towards his loved ones. Merciless, is such a multi-layered character! He was ever at odds with his internal feelings about being a supervillian, and is so in love with his wife. Each time he faced an obstacle, he just jumped right in with barely a thought or a plan, but somehow he managed to come out on top. Well, there were times when his henchmen, and wife would save him, but he never hesitated. Loved the story, and the ending really surprised me! I can't wait to see how book three unfolds! If you are looking for a good story, and laugh, I definitely recommend this story and series! I didn't have high expectations coming into the story, but I found it oddly charming. A bit too absurd, but still fun. CT Phipps has once again proved that he can and will write the most snarky, sarcastic, and hilarious "villain" ever. Bar none these books are a great mix of humor and action with a small amount of love sprinkled in. This book delivers and narrator Jeffery Kafer brings it to life. I can't wait for the next one! Our hero continues to do what he does best at not being an actual hero. Loads of fun like the first. Great pacing and more of what you loved in the first novel. Recommended. Snark. Bait and switch. Laugh out loud funny on several occasions (even to one not usually given to it). Huge cliffhanger. Like the first? You'll like this one, just as fun! I really enjoyed this book just as much as I enjoyed the first! We get to learn even more about the main cast of characters and their backgrounds while learning what happened while Gary was away. The humor keeps up with the previous book's and kept me entertained for the entire duration. What I think I enjoy the most about this series is that Gary doesn't take much seriously and the result of that is a light-hearted adventure with superb narration by Jeffrey Kafer. 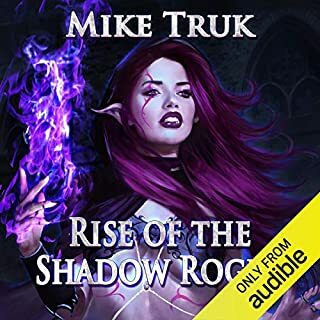 I ended up hopping back and forth between the Audible version and the Kindle version (thanks Whispersync!) as I was excited to keep hearing/reading more. Sadly (at the time I'm writing this), it looks like book 3 does not support Whispersync... (though strangely book 4 does??) which is quite disappointing. Worth a read and/or listen! 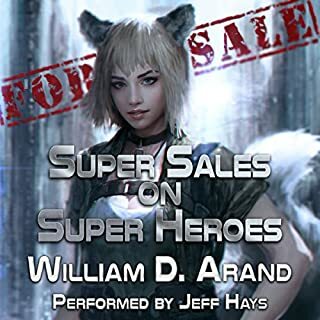 This is one of those where you really want to get the audio version, between the author's comic prose and the narrator's delivery, it really is a laugh a minute. This book is basically going to appeal to anyone who's vaguely geeky, male or female, especially if you're in your thirties or forties. With references from Tolkien and Pratchett to Ghost Busters and Star Wars, Phipps manages the kind of nerdy humour that leaves you laughing out loud, without needing to put anyone down or resorting to constant toilet humour. On top of all this the book actually has a genuinely interesting comic book type plot. I can't think of another author I can compare Phipps to because while there are authors who write similar stories, as a female a lot of the supposedly humorous writers leave me cold but I think most people who like shows like The Big Bang Theory would find themselves laughing along to this. This second instalment of The Supervillainy Saga is every bit as good as the first. I'm a fan of superhero books in general and I think I now consider this series to be my favourite of the genre. This story turned out to be exactly the sort of thing I expect to get when I pick up a superhero comedy novel. It was packed with action, had plenty of memorable characters, and was dripping with hilarious humor(mostly of the sarcastic variety). The plot was good and C.T. Phipps has an engaging writing style. This picks up where the first book ended with Gary Karkofsky AKA Merciless:The Supervillain Without Mercy returning to his home town after escaping a super prison on the moon. Due to a transporter glitch a month of his life has disappeared. To make matter worse the city has been overrun by hordes of zombies and Mandy, his wife, has been kidnapped by a rival supervillain. Gary has to rustle up his evil henchmen, Cindy and Diabloman, to help him set things right. There was also the minor problem of having to save the world from being destroyed by a doomsday cult who are eager to summon their demonic master into the mortal realm! The story was a ton of fun. I loved the banter between Merciless and his team and was caught up in the crazy happenings of the story. Gary and his friends are easy to love despite their villainous natures! The ending was a bit of a shock. The best thing is that it almost guarantees a sequel. One which this guy will definitely be reading as soon as it gets released. I doubt anyone could have read this better than Jeffrey Kafer did. He was a perfect fit for Gary and really got the tone of the story. funny and witty, the story is always enjoyable. good narrator as well. too bad for the ending however but it's good to know there is still another book to go through. I should start out by saying that if you haven't read/listened to book one, you really should start there. This was easily as enjoyable as book one was! It was fast paced, funny and very well done (by both the author and the narrator). I will say that the thing this book does best is to subvert expectations. Every time you think you know where it's going, it goes in another direction completely! If you listened to book one and are on the fence about the rest of the series, just listen to this as your proof of how good these books can be! I love the story so far and the narrator has been well chosen for this.